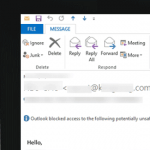 Home » Outlook » How to Unblock Unsafe Attachments in Outlook? 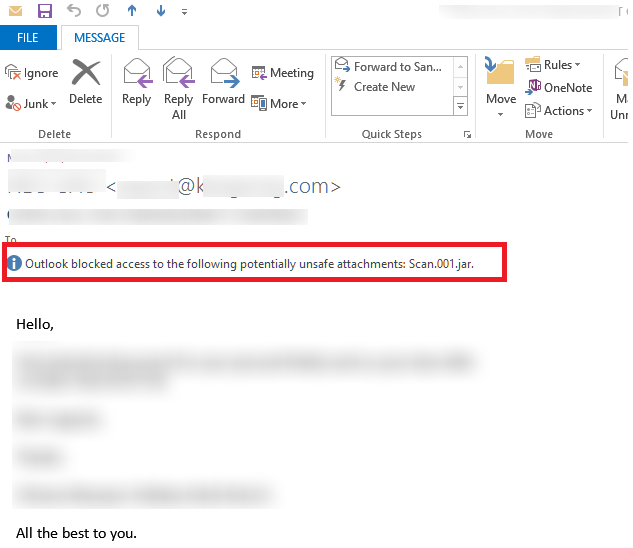 How to Unblock Unsafe Attachments in Outlook? To open a blocked file, you can ask the sender to rename the file extension to a temporary extension that is not included in the list of blocked files and send it with a new email (for example, the file setup.exe can be renamed to setup.ex_) or pack the file into a ZIP or RAR archive. Start Outlook. Now attachments with the specified types of unsafe files are unblocked. If you use ADMX templates to manage your Office apps, you can manage the list of safe attachments in Outlook using a policy in the following GPO editor section: User Configuration\Policies\Administrative Templates\Microsoft Outlook 2010\Security\Security Form Settings > Outlook Security Mode. If your Outlook connects to your Microsoft Exchange server, note that the Exchange administrator can specify the types of files to be blocked. For Office365, you only need to use the last 4 code lines.